So having suffered at the hands of the traditional pagans and the newly established Christians, it is unlikely that they had much hope that the new pagan emperor was going to be any different to what they had been used to. They would probably not have guessed that they were about to get just about the most pro-Jewish gentile leader in history. Nor would anyone else. But Julian was a man who was always full of surprises. I think the best way to think of him is to imagine someone today growing up in a strongly working class area, Pittsburgh, Sheffield, somewhere like that, with left wing parents. Say they were union officials or some similar right on types. He shows promise, goes off to college and comes back an ardent libertarian free marketeer. He baffles everyone. He knows all the foundational texts of socialism. Unlike all the traditional believers he has actually read Marx. He knows all the arguments back to front so there is no point trying to win him back. But he is equally bizarre to his new friends on the right. They haven’t read people like Hayek either, and can’t keep up with free market jargon, so are often just as baffled as to what this guy is on about. This is how I see Julian. In his time religion was the major point of controversy rather than politics, but he had basically crossed from the side you would expect him to be on to being a partisan for the other side. This gave him a radically different perspective on things to just about everyone around him. He wasn’t brought up a pagan. He had to study it and learn it. So he didn’t pick up the traditional disdain of the polytheist for the monotheism of Judaism. In fact far from it, he had studied the old testament carefully and had worked out his own ideas about what the teachings of Moses really meant. I have a feeling that under other circumstances the Jews might well have been much happier without that level of interest from an outsider. But Julian was in a position to help them and did so when he dropped the extra taxes the Jews had to pay – which must have opened their ears. He also proposed to let them return to Jerusalem. At this time Jerusalem had already acquired its status as a religious tourist destination and the Christian holy places were generating healthy trade revenues. There was little evidence of its long history as the centre of worship of the Jewish faith. The temple on Mount Zion had been destroyed with typical Roman thoroughness by Hadrian. The ruins had been removed and the ground ploughed up. In news broadcasts about the current problems in the Middle East it is often pointed out that the temple mount is sacred to three different religions – Islam, Christianity and Judaism. In fact there is a fourth one with a claim. After the destruction of the Jewish temple by Hadrian a temple to Venus had been built. Let’s keep that one to ourselves shall we? In think they have enough trouble out there already. The removal of the Jews from Jerusalem had been the Christians’ big break and its development as a point of pilgrimage was a nice little earner. So it isn’t surprising that they found the destruction of the Jewish temple to be something of a sweet moment for them. The story grew up that Jesus had predicted the destruction of the temple and that it would never be rebuilt. It must have been a comforting prophecy for the traders making a living there. As prophecies go it must have seemed like a pretty good bet. After all a Christian emperor was in on the act. And even in the event of a pagan emperor they were hardly likely to trouble to rebuild a temple to a god they didn’t acknowledge to please a small group of habitual malcontents and troublemakers. Nobody anticipated an emperor like Julian. Lots of people find thinking outside the box a bit difficult. Julian on the other hand rarely seems to have thought inside the box. He looked at Jewish scriptures through his neoplatonic lens. Where other people might see an incompatible monotheistic religion with troublesome requirements that were a potential for public disorder, Julian recognised another imperfect but still valuable reflection of the One. The only trouble was that the Jews were not fulfilling the requirements Julian had picked up in the texts for performing sacrifices. On enquiring it turned out that the problem was a practical one – without a temple in Jerusalem there was no sacred place to carry out the sacrifices in. 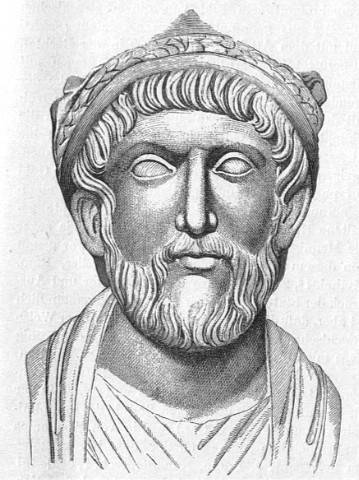 A tough problem for most people, but Julian was an emperor. He could order the temple to be rebuilt. This would not just bring the Jews more closely into line with his religious ideals, it would disrupt the Christians’ revenues from the holy places. So that was good too. And it would also flatly contradict the Christian prophecy. What’s not to like? And that is without even considering the long term benefits of creating a reliably anti-christian institution bang in the middle of the Christian heartland. Julian took this project very seriously, putting Alypius in charge of it. Alypius was a native of Syria who at the time was running the province of Britain and was one of Julian’s closest friends. On top of this high level state backing the Jewish community shared in the enthusiasm providing further funds, labour and equipment to clear the ground and to lay the foundations for the re-establishment of the centre of their religion. Unfortunately despite all this the whole thing turned out to be in vain and nothing was achieved. Six months after the start of the project Julian was dead, and with him any hope of its successful completion died as well. The Christian writers were quick to attribute the failure to the the direct intervention of God. There had been earthquakes to upset the clearing and digging and firebolts had been shot down from Heaven actually burning some of the workers. It would be easy to dismiss these testimonials from Christian sources. They tend to lie a lot. But pagan sources tell the same story. It is notable that God seems to have adopted Jupiter’s signature means of communicating his displeasure on this occasion. It could well be that the pagans were just as cheesed off with imperial resources going to such an eccentric scheme as the Christians were. Julian really was one of a kind and it is hard to imagine anyone else conceiving of the idea in the first place, let alone actually instigating it. Julian’s promise to return to share in the worship at the newly consecrated temple was never to be fulfilled. But like much of his life, it is almost impossible not to speculate what might have happened if he had succeeded. A Jewish temple that survived the fall of the empire and which lasted to the present day would almost certainly have had some kind of effect on history, whether for good or bad it is hard to say. Might it have been a focus that allowed a Jewish state to be created centuries earlier than the present one? And if it had would that have helped? Given the grim nature of the history of the Jews it could hardly have made things much worse. But that has to be speculation. What is certain is that there was never going to be another emperor like Julian. Brilliant post. Thanks for breaking it down into lovely little pieces. I found myself re-reading certain phrases because they were so clever and funny. Thanks for the work that you do, it is greatly appreciated! Thanks for your kind words – blogging can be a very lonely business and any feedback is greatly appreciated especially when it is so positive. To be honest I am breaking it down to spin Julian out for as long as I can as I find him such an interesting character. Its a good story, very inspiring. I have always admired Julian as a kind of underground rebel against fanatical tyranny. I grew up surrounded by political rather than religious enemies. I am what is commonly called a Red Diaper Baby. My enemies were Communists rather than Christians but I learned to despise the bloodthirsty cult of Marxism as much as Julian did the Christians against them at a very young age. My own site “Liberty2100.com” describes some of my personal feelings and experiences growing up with these people and hearing their plans for destroying Western Civilization in the same way the early Christians undermined the Western Empire. My dad's best friend, was Victor Hammer, brother of the notorious Armand, close associate of Al Gore Sr. and son of Communist Party founder Julius Hammer. (Dad once shared a guest bed with Leon Trotsky at their house) Being sent to assorted communist summer camps and winter resorts in the Catskills gave me an inside look at their evil plans: taking over educational systems, the media and signing up enough people on welfare to bankrupt the US capitalist system. (That effort was the goal of Acorn) Julian had grown up seeing the cruelty and corruption of the Christian leaders from the inside, learned to detest them and awaited his turn to strike against them. One of my prized possessions is a nearly uncirculated large bonze coin depiction Julian with his pagan beard on one side and the sacred bull of Mithras on the other. (The birthday of the Sun god Mithras was Dec, 25 and ritual meals of bread and wine became his flesh and blood at Mithraic ceremonies) Julian, living in the days before the Christians got around to burning the Alexandrian Library and armed with his brilliant intellect was a mortal threat to the new organized superstition which had so recently conquered the Roman Empire. ( I am convinced he was assasinated) He decided that the Jews were a very useful ally in his efforts to restore classical civilization and prevent the dismal future he saw. Just as Church leaders to this day are often morally and financially corrupt, most the leaders Marxist regimes live lives closer to that of the most despotic Roman emperors rather than members of the working class they claim to represent. Interestingly, one Marxist scam was establishing a new holiday on Vladimir Lenin's 100th birthday, April 22 1970. It is called “Earth Day”, and to this day the so called Environmentalists show their true colors (Various shades of red) when they say nothing about Cuban oil drilling in the Florida straits or George Soros getting billions of tax payer money to drill off the coast of Brazil. I just hope that our internal Red termites are less successful in their efforts to undermine America than the early Christians were at over throwing the Roman Empire. I just hope we can find a leader with the brilliance of Julian to save us from a similar fate. I agree Ajay, I have always seen quite a close analogy between the Christian Roman Empire and the Soviet Union. Thought police, purges of ideological deviants, price controls and economic stagnation – there are a lot of parallels. I have been putting off the next episode in my Decline and Fall review as long as possible because I am going to have to kill Julian off in it, but once I have got that out of the way I've got an essay lined up about what might have happened had he lived longer.